Launched in the UK in late 2007, the Pearl™ YSGG laser device from Cutera is marketed as “a minimally invasive laser to improve the appearance of wrinkles, uneven texture, age spots and sun damage with only one or two treatments and minimal downtime”. Cutera believes that there is a growing demand amongst patients and practitioners for a more aggressive treatment to address wrinkles and uneven skin texture whilst minimising the recovery time experienced with other ablative technologies. In developing the Pearl™ YSGG laser, the first of its kind to use a 2790nm wavelength for a cosmetic application, Cutera believes that Pearl maximises the ratio of cosmetic benefit to patient downtime and discomfort. Yttrium Scandium Gallium Garnet (YSGG) laser with a wavelength of 2790nm. With water as the target within the skin (known as the chromophore), Cutera engineers sought a wavelength with the ideal water absorption characteristics that would provide a balance between vaporisation of the upper epidermis and residual heat generated in the lower and upper dermis. This balance would allow them to achieve the appropriate levels of ablation, coagulation and collagen remodelling. A crystal that provides the correct wavelength existed, but until now had not been developed into a laser for dermatology. Yttrium Scandium Gallium Garnet (YSGG) generates a wavelength of 2790nm and has a water absorption coefficient that lies between Er:YAG (2940nm) and CO2 (10,600nm), which are traditionally used for laser skin resurfacing. Pearl™ gained European CE Mark approval in July 2007. In the USA, it was cleared by the American FDA (Food & Drug Administration) in March 2007 for the treatment of wrinkles. It depends on many factors such as the structure of the skin, lifestyle, age and skincare. 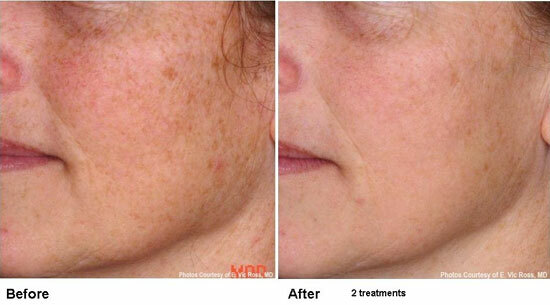 Brown pigmentation comes back if the skin is exposed to the sun again, also wrinkles and scars can return after a while. Further treatments may be necessary. After treatment, the skin tends to look and feel mildly sunburnt for the next couple of days. A fast-healing ointment such as Aquaphor™ from Eucerin should be used right after the treatment to soothe the skin, which you should continue to apply for 2 - 3 days. On the third or fourth day, you will start to notice some peeling. Once the superficial tissue has peeled off, fresh, bright healthy skin will be revealed underneath. Make-up may be applied at this time. You will need to protect your face with appropriate clothing, such as a hat, and limit your exposure to the sun for a few days after treatment, since you cannot wear sunscreen during this time. There have been no reported side effects or increases in wound care associated with these treatments. Pearl™ treatments can be safe and effective for skin types I - IV (fair to olive skin). However, it is clearly best to select a physician adequately trained to screen candidates based on their skin type. The time taken for a treatment session will depend upon the size of the area being treated, for example a full face and neck treatment will take approximately half an hour. In most cases, results can be seen after one treatment. A combination of wrinkle reduction, pigmentary improvements and smoother texture are obvious. Some patients may require two treatments spaced approximately one month apart to achieve the desired results. The cost of a Pearl™ treatment depends on the area(s) being treated but on average costs approximately £1,000 per session. Images provided courtesy of Cutera UKLtd. Barry Di Bernardo, MD. High-Fluence Treatments with a 2,790nm YSGG Laser. E. Vicor Ross, MD. Clinical and Histological Results of Full Face Treatments with the 2,790 nm Pearl YSGG Laser System. Click for ALL Pearl™ YSGG clinics in the UK & Ireland registered and verified by Consulting Room.